Prepare cake batter according to directions. Line a mini muffin pan with mini muffin liners. 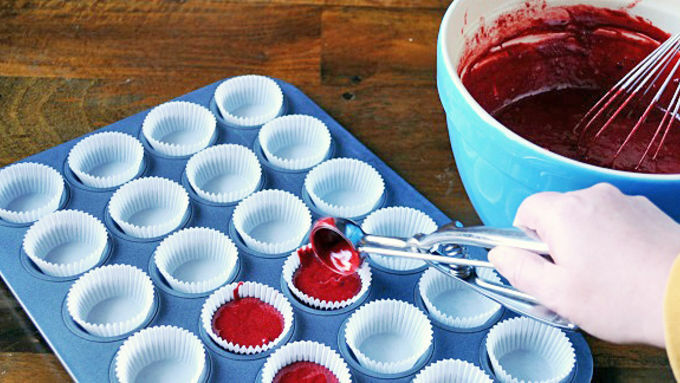 Using a mini cookie scoop or a spoon add batter 2/3 of the way up the mini cupcake liner. Bake at 350°F for 13 minutes. 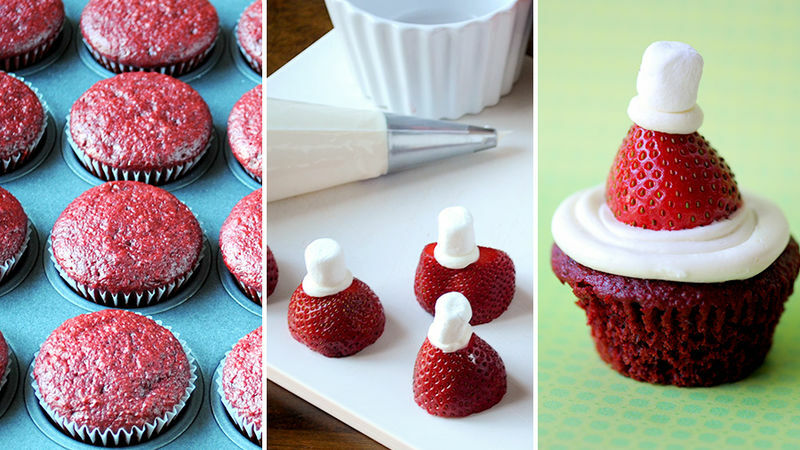 While cupcakes are baking, use a knife cut off the top of the strawberry where the stem and leaves are to make a flat hat. 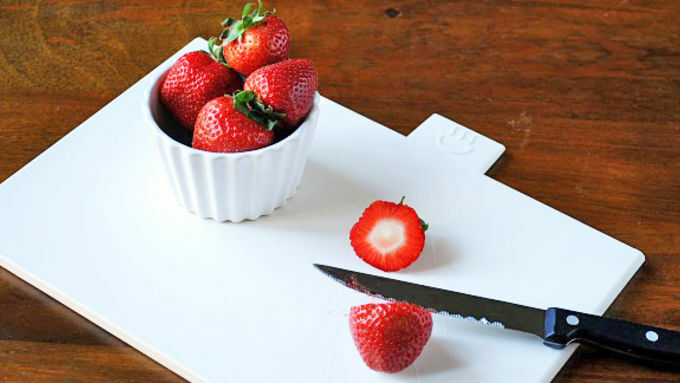 Slice a little off the bottom of the strawberry. Pipe a little dot of frosting on top of the “hat” and add a mini marshmallow. 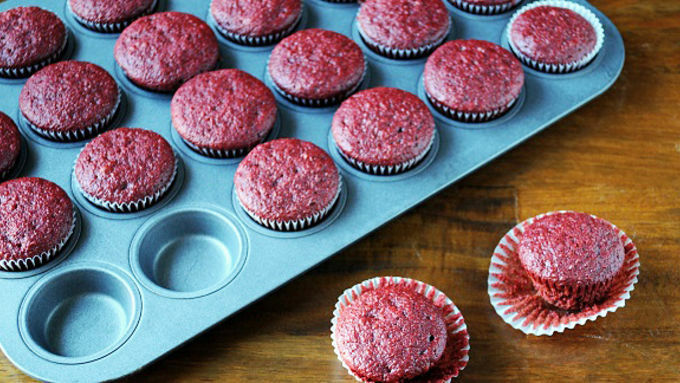 Remove cupcakes from oven and allow to cool. 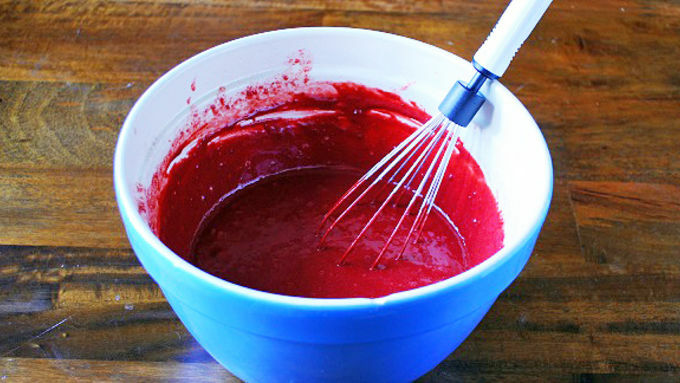 You have the option of removing the cake liner as it will give it more of a dramatic look with the red cake showing. Pipe frosting in a circular motion on to the top of the cupcakes to form the bottom of Santa’s hat. 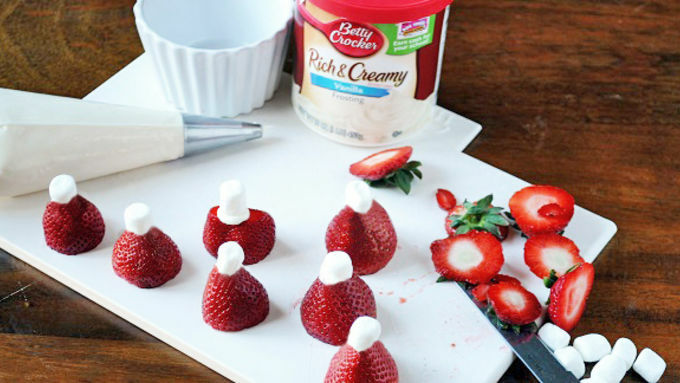 If you prefer, you can smooth out the frosting before topping with the strawberry Santa hats. 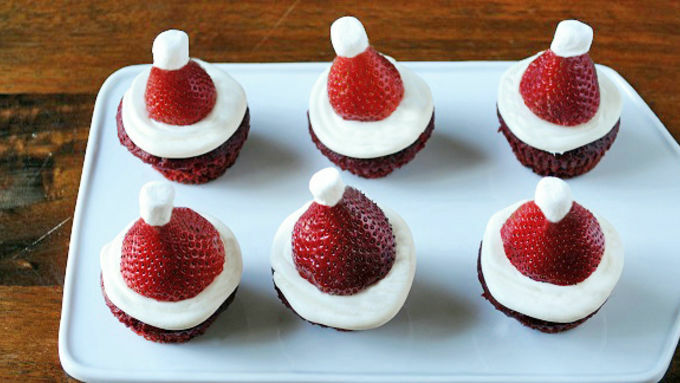 Top the cupcakes with the Santa hat strawberries. The holidays are in full swing, and Santa will be sliding down your chimney before you know it. 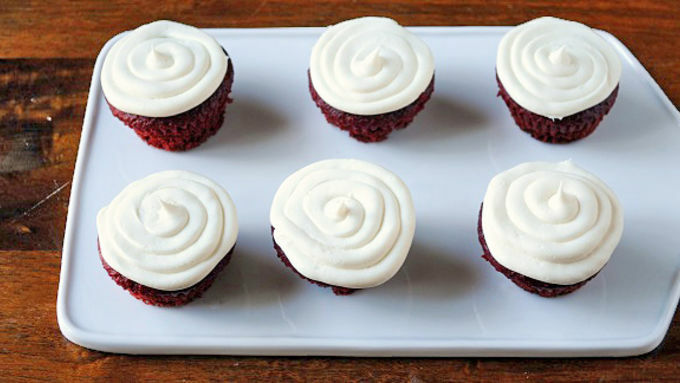 So why not make these Santa Hat Mini Red Velvet Cupcakes for your upcoming holiday gatherings? They may look complicated, but they're pretty darn easy. 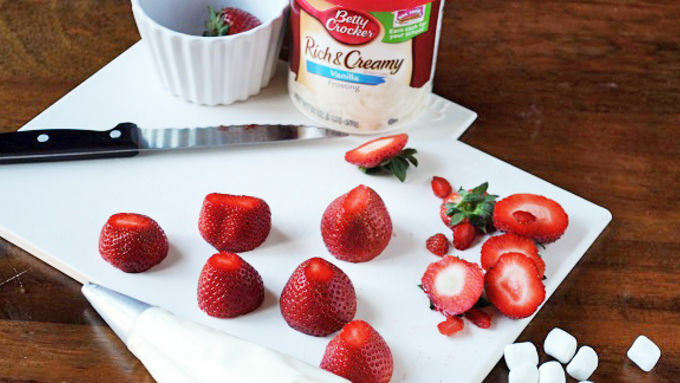 Using Betty Crocker products helps to cut down the time. 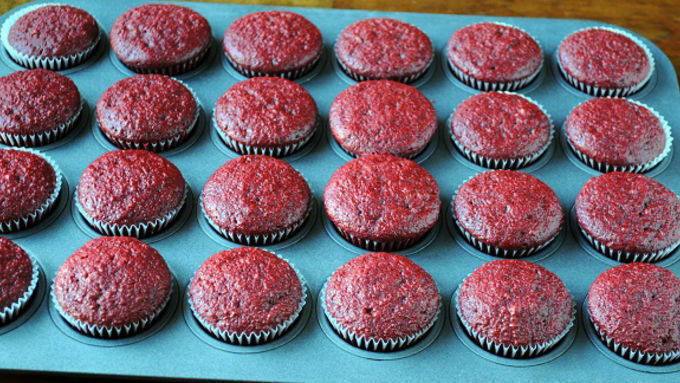 The recipe makes 48 cupcakes, so it's perfect for a holiday party crowd! Happy Holidays!